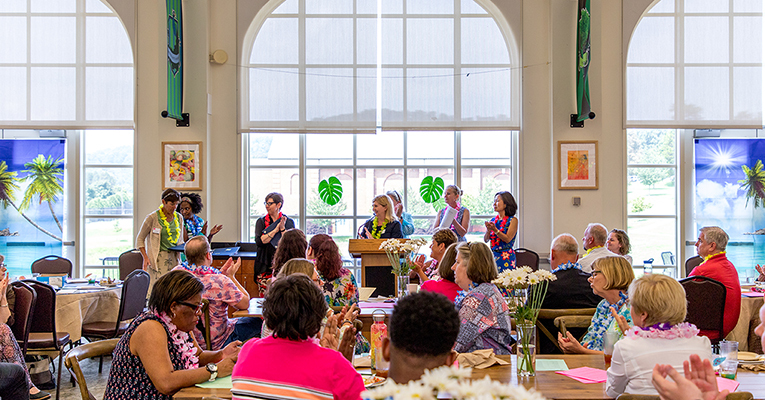 During a Hawaiian-themed employee luncheon in Prothro today — part of the first professional development day at Sweet Briar — College leaders announced the winners of this year’s ROSE Awards. 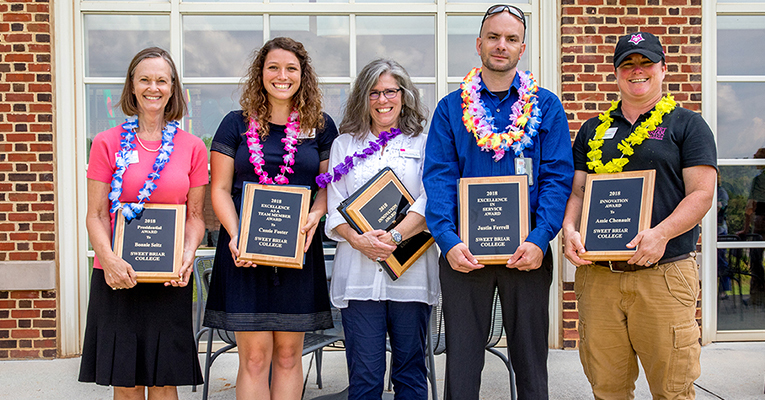 Launched in 2006, the awards honor staff excellence across campus. Nominations are made by supervisors and co-workers; award winners each receive a plaque and a $500 stipend. Their names are also engraved on a plaque in Prothro. 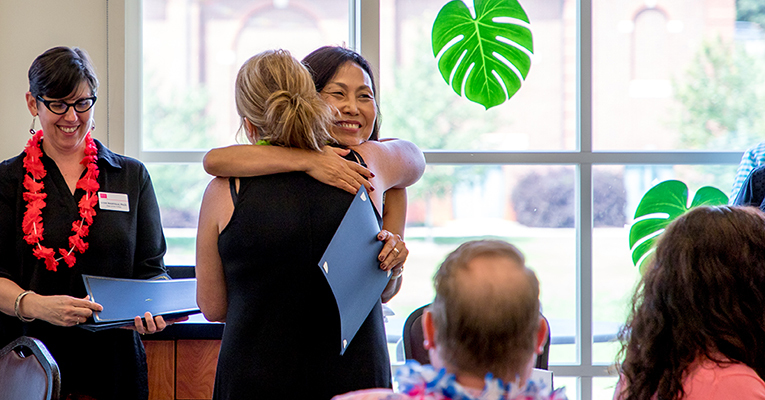 Melissa Richards, vice president for communications and enrollment management, led the ceremony, while President Meredith Woo presented nominees and award winners with their certificates and plaques — and lots of hugs. President Meredith Woo presents Melanie Campbell, director of admissions operations, with a ROSE Award for Innovation. The Presidential Award is given to an employee who displays high character, dedication to the College, commitment to results and who values the College and its community. In 2018, there were two winners in this category: Bonnie Seitz in alumnae relations and development and Nancy McDearmon in galleries. 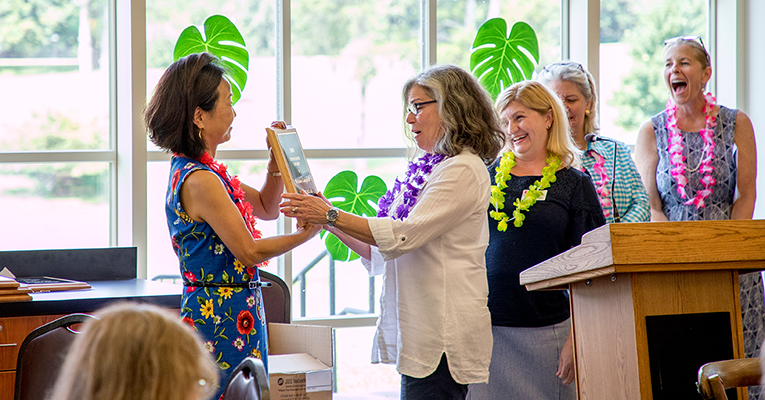 McDearmon, who recently retired after two decades at Sweet Briar, was nominated three times for this award, as well as five times for Excellence in Service and three times for Excellence as a Team Member. President Woo congratulates nominee Kristie Evans. Other ROSE Award nominees this year included Beverly Tipps (Excellence in Innovation); John Bailey, Gertie Coley, Kristie Evans, Luther Griffith and Savannah Oxner (Excellence as a Team Member); Luther Griffith, Jaze Spradley, Ronnie Staton and Beverly Tipps (Excellence in Service); and Claire Griffith, Luther Griffith, Mary Pope Hutson, Amy Ostroth, BJ Phaup, Kathleen Placidi and Mimi Wroten (Presidential Award). Before the ROSE Award ceremony, Luther Griffith was presented with the Volunteer Service Award by Barbara Watts, director of career services, for his generous volunteer work in the Career Services Center over the last two years.